And while I’m working on an art project for Competition Season 2019, I don’t want anything delaying my progress. Chew Mail Pouch Tobacco. 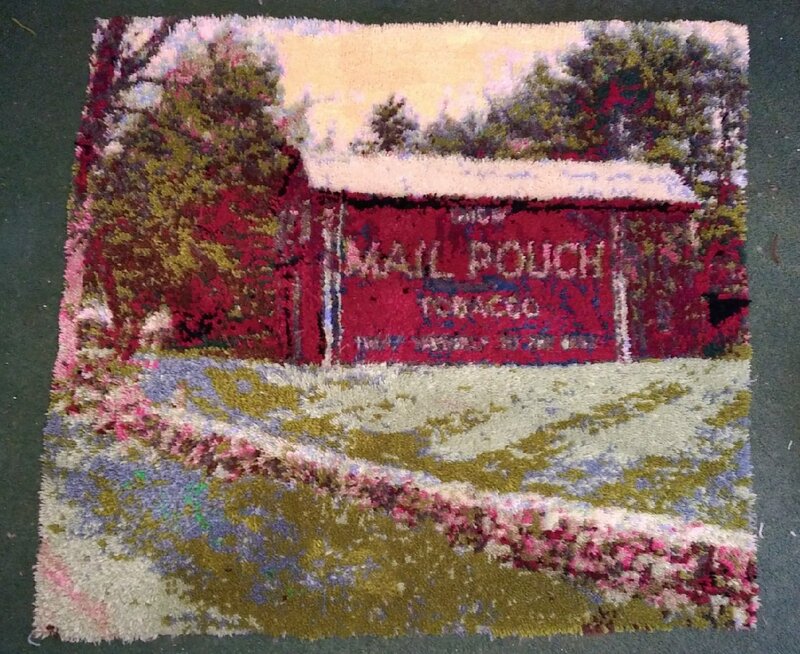 Latch hook rug made from acrylic yarn and wool yarn. (c) 2018 Chuck Miller, all rights reserved. I’m currently working on the second of two latch hook rug projects. The first one, which you see on the right, took nearly six months to complete. My original plan was to order all the yarn packs from one source – an online retailer named Mary Maxim, but Mary Maxim didn’t have all the yarns I needed – and, in some cases, they weren’t even making certain colors any more. I had to source my yarn from a variety of retailers, including eBay and etsy, just to get this finished. For my current art project, I looked online for a different retailer. One I could count on to get my project finished. I located such a company – a yarn and hobby retailer in Wisconsin called Herrschners. Using the pattern project output code (the number of yarns I would need for each specific color), I ordered all the batches (320 strands per batch) directly from Herrschners. This way, I wouldn’t have to wait for any last-minute stitchings. And the price – at $1.19 per batch – was very reasonable. But as the project progressed, I noticed that maybe there were some colors that I didn’t receive in my shipment. I needed 40 strands of a shade called ecru – there was no ecru in my box of batches. Maybe I miscalculated, or maybe they were just out and it was on backorder. No matter, I ordered another batch of ecru and a few days later, it was in my mailbox. Project continues. Now we come to a shortage. Part of my project involves hooking at least six batches of a deep blue shade called cornflower. And for some reason, started running short on cornflower. I also noticed that the box of batches contained a batch called light aqua. Which … I don’t remember ordering. Probably an accident. Look, if you’re ordering 120 batches of multiple colors, there’s going to be human error in the shipping, I get it. Ship happens. So I place an order for two batches of cornflower and one batch of dark cornflower, which I sensed I was running short on as well. I paid for rush service on this. By my calculations, any delays could cause me to NOT finish this project in time to enter it in Competition Season 2019, and I don’t need it sitting around for Competition Season 2020 if I don’t need it to do so. On Monday, my package arrived from Wisconsin. I opened it. Here’s the cornflower … here’s the dark cornflower … and why is there another pack of light aqua in the box? Listen. There are only two instances in life where one would specifically ask for aqua. But yeah, I wanted my shades to specifically match my pattern. If they’re off by even one Pantone shade, it’s going to be noticeable. A better example. How many shades of lipstick are there? As far as I’m concerned, there’s red and that’s it. Every person who ever used lipstick will now yell at me about how there’s thousands of shades and if you choose the wrong shade it will not look good on your lips. Gotcha. Time for a phone call to Wisconsin. They ask for my invoice number for the order. I give the number to the customer service rep, and politely explain that I had ordered two shades of cornflower and I received one shade of cornflower and one shade of light aqua. Well there you go. Sounds like if Herrschners made a mistake, they will rectify the mistake instantly. And I didn’t even have to ship back the light aqua batch. Okay, I’ll take that as a win. And it keeps me on schedule to get this project done in time for Competition Season 2019. Which, in itself, really helps me keep motivated. 2 replies to Herrschners – how was your customer service to me? I have a 40+year history with this company. They operate with “old school” values, the customer is always right. I’ve never, ever, been disappointed.